It is said that imitation is the sincerest form of flattery. If then, our imitation is a confession, then let us explain the purpose of it; let us delineate the mission of 3rd Platoon/Delta Company/2nd Battalion/5th Cavalry Regiment (3/D/2-5 Airmobile), 1st Cavalry Division, Airmobile (Reenactment). Our mission is twofold. We are affiliated with the Pacific Northwest Historical Group (PNWHG), which is well known for its first class World War II reenactments and displays. On the outset and within a very superficial level, this group of brothers exists to host, exhibit and maintain the highest and most professional level of Vietnam War reenactment and displays in the United States and the World. This is a lofty statement indeed! It is a goal that we have attained and that we seek to uphold, maintain and even surpass as our knowledge, abilities and collective resources grow ever deeper and wider. How do we achieve this? Look at our website. It speaks for itself. We are all young men, in the prime of our lives, and we demand the best of our unit and ourselves. We have a wealth of active duty and National Guard experience. We seek to build a unit of young fighting men that we hope will parallel the world that our fathers' occupied so many, yet so few years ago. BUT, WHY DO WE DO IT? Inevitably we are all asked this, sometimes with a great deal of hostility, as though the question were an accusation and indictment against us and the war that so divided our nation. This is the most difficult question to answer, due to the varied responses that it would invariably elicit from the men of 3/D/2-5 Airmobile (Reenactment). Nevertheless, it is this answer that differentiates us from gun toting wannabes with vintage uniforms; our sincere response to this question provides the concrete foundation for our mission and for what makes 3/D/2-5 Airmobile (Reenactment) special. How many Vietnam veterans will go to sleep tonight without having ever been thanked for what they did? How many of those veterans will be cursed with a short night's sleep of 3-4 hours because a significant part of them is still in the war? How many of these men will go to their graves without the satisfaction of knowing that someone appreciated what they saw, did and sacrificed? This is our mission. We exist to say "thank you" to the true fighting men who fought and bled in Vietnam. They are our credentials. The freedom they bought for us in a far off land is beyond any feeling of gratitude that we can express. We cannot thank them enough. By imitating them – by flattering them – 3/D/2-5 Airmobile (Reenactment) hopes to understand in the best possible way what the infantryman experienced. Vietnam was, essentially an infantryman's war. The grunt bore the brunt of the war on his shoulders, and he bore the brunt of the criticism leveled against it by his peers. In understanding, in preserving his memory and in keeping their collective spirits alive, we hope to give any and every veteran of Vietnam, and of the military during that time, a resounding "THANK YOU" and "WELCOME HOME"! We feel that understanding is best achieved through reenactment. We can study books. We can acquire magnificent collections and we can let our hearts bleed all we want for the veteran, but in reenactment, we can attempt to comprehend through our own lives, in isolated moments, what it meant to fight in Vietnam. We make no pretenses about understanding the horror of war or about death. After a few days, we can easily go home, wash our clothes, kiss our wives/girlfriends and watch the ridiculousness that surrounds us. We can enjoy our liberty. But for a few days, it is our mission to grasp what it means briefly to leave that liberty and be a part of something that few have the ability or the desire to understand. We have always received positive feedback from Vietnam veterans. It is a common misconception that we are an insult to them and that we perpetuate something few people want to remember. This is false. Once these veterans understand our dedication and our desire to accurately tell their story, they are more than thrilled. The highest praise we can receive is to see how much a veteran appreciates being told "Welcome Home". If our imitation is really a confession of who we are, what we believe in, what we strive to be and what we could never be, then we freely admit that reenacting is also a serious hobby from which we derive a sense of satisfaction that cannot be matched by watching ESPN and chowing down on a bowl of potato chips. If we are to live vicariously through the lives of other men, then we choose to live through the lives of the true heroes of our nation. We cannot pretend to represent every facet of the lives of the men who fought in Vietnam. We cannot even hope to portray every bit of the 10% of the men who served as the boonierats in Vietnam. We stick to one specific unit: 3rd Platoon of Delta Company, 2nd Battalion, 5th Cavalry, 1ST Cavalry Division, from 1968 to 1970. Our unit plays no favorites. Our men earn their rank, their respect, their accolades and the occasional misfortune of failing as soldiers. We administer 3rd Platoon as a regular Army unit would be run in the field in Vietnam. We carefully solicit the advice and the approval of men who served as infantrymen in Vietnam (from all time periods). In fact, 3rd Platoon of Delta Company was chosen because the founding members knew a man who served as a radiotelephone operator (RTO) in that unit during that time. We also stick to this time frame for other, much more practical reasons. Many of our members do not have the time, the resources or the money to purchase collections beyond what they need to reenact (which includes the expense of buying an M16/AR15 variant). By placing our focus to latter years of the war, we are permitting our members the utmost flexibility in the equipment they carry (Vibram vs. Panama soled boots, limited use of nylon gear, etc.). Furthermore, as historians, we recognize the danger in using and beating up rare, and difficult to find uniforms and equipment from earlier in the war. Wherever possible, we encourage the use of reproduction items, as long as they are acceptable, appropriate and as close to the original items as they can be. The men of our platoon who do not have formal military experience undergo thorough and intense military training administered by the members who are qualified infantrymen. We do this so that they can act and perform as soldiers. We are not a group of civilians in expensive outfits with fancy weapons who do as we please. 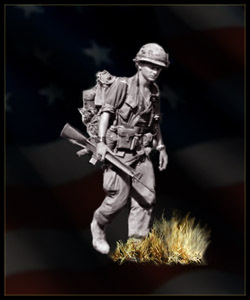 Our platoon leader has the ability and the resources to call upon the advice of veterans and of an active duty infantry platoon leader, who likewise serves the 3/D/2-5 Airmobile (Reenactment) as a specialist 4th class. New members are assimilated into the unit as new soldiers. We break up groups because most GI's entered their units as individual replacements. None of our reenactments feature any other American units. While recognizing and appreciating the unique and valuable contributions of Special Forces, LRRP's, Rangers, SOG and other special operations units, we do not wish to become trite in a misguided desire to focus solely on a very small and exclusive group of special soldiers whose experiences did not reflect, on the whole, those of the average infantrymen. This permits us to avoid the pervasive and annoying "Rambo" syndrome that is common among reenactors, which is something that discredits our efforts and the hobby as a whole. This is our confession. We are united in our love for the United States and for the heroic fighting men who served it in the past and who serve it now. Thank you for taking the time to visit the 3rd Herd's website!